I’m not posting much content from couple of weeks for one good reason, which is preparation for VCXN610 Exam. 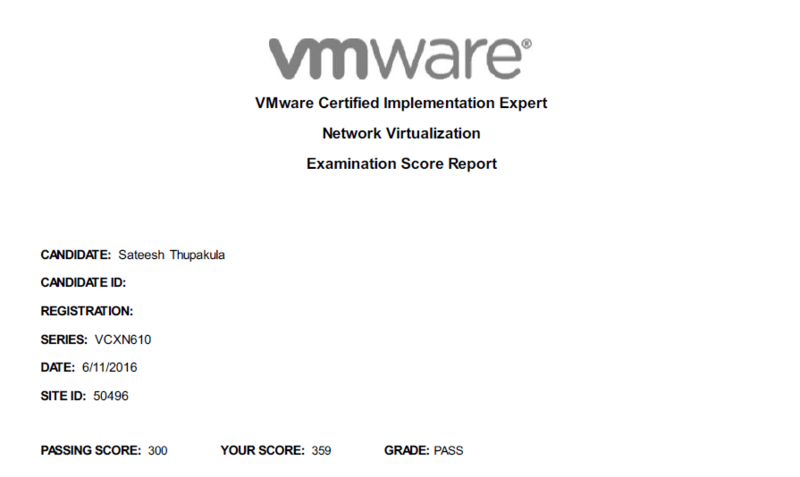 Recently VMware Education and Certification Blog released announcement for “VCAP5 Exam Retirements Suspended – Registration Remains Open” which allowed me to attempt this exam yesterday which is 11th June 2016. Earlier they mentioned this exam is going to be retired by 2nd June 2016 – check this blog entry. I had been aiming to take this exam from beginning of this year but other commitments got in the way and I took my first shot yesterday and cleared it. As people know with the VCAP/VCIX exams are lab based exams, some questions are linked and you need to be careful to not screw up or incorrectly complete a question as it may impact further questions down the track. For example if you deploy NSX Controller in wrong Network, your Edge (North-South) gateway set wrongly, OSPF mis-configured such things can cost a failed attempt. This blue print is updated on 25 August 2015. VMware recommends that a candidate thoroughly understands the objectives indicated in this guide and utilizes the resources and courses recommended in this guide where needed to gain that understanding. Attention you are going to attempt exam based on vCenter 5.5 and NSX 6.1.x versions but labs from HOL are based on NSX 6.2 version. What to do nothing to worry search for HOL Archives where you can practice Labs based on 6.1.x version. As everyone mentioned in their experience, LABs are located in United States of America and I personally faced too much latency from India while accessing web-client and double click on any of the options. You need to read the instructions carefully as they ask for multiple tasks in single question. Some topics like NSX Controller, LDR & Perimeter Edge are critical for successful deployment of NSX Setup and you need to practice them again and again. You need to explore each option available in NSX Manager and Networking & Security consoles.